Telephone wires in most older suburbs and parts of the city still lie above ground, mounted on poles like this one. Several years ago Telkom, our (often regarded as infamous) land telecommunications provider, started using underground cables to in new development areas. I'm guessing that they're more durable and serviceable. Some day telephone poles like these, with their busy nest of wires, will be a distant part of history - much like candle-powered lamp posts. 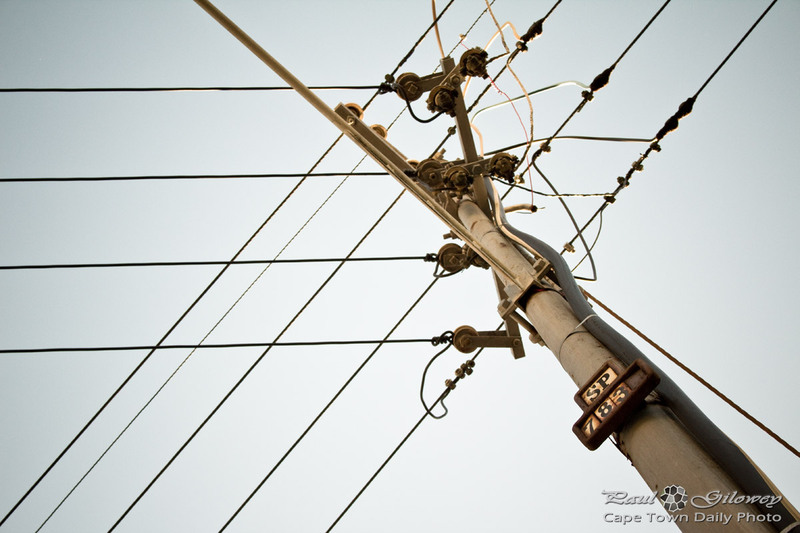 Posted in General and tagged poles, telephones, wires on Monday, 19 March, 2012 by Paul. you’re thinking of power lines, at least thats what you’ve got in the photo. Telephone lines are the single lines on poles normally running down the back of properties. I find them quite unobtrusive, until Telkom decides to trek through my land to fix a neighbours issue.